We invite you to come visit the rescue site where you can walk right up to the rescue shaft where the miners emerged from the dark, cold mine 240 feet below after 77 hours of frigid darkness. 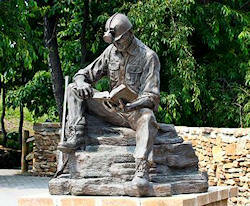 You will be greeted by the 7 foot tall bronze statue of a coal miner at the top of the walkway into the rescue site. Hear the story of the miracle from people personally involved in the rescue. Touch the rescue capsule and try to imagine how it would feel to squeeze into it with your strength nearly gone. Please check the Visitor Information page to find out more about our hours of operation and the best times to visit the Monument for Life. Bus tours are welcome, but please make arrangements in advance. You can find out more by visiting our Bus Tour Info page. Features of this site include a mobile-friendly design that will make our site easier to view on cell phones and tablets. There are also be more ways to donate to our building fund to support the new permanent home for our collection of rescue equipment and memorabilia related to the event. This includes the actual miner rescue capsule and drill bits used in the rescue of the miners. There is also an auditorium area where visitors can see a live presentation that tells the whole story of the mine accident and miracle rescue of the nine trapped miners. 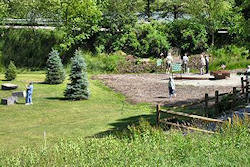 Please let us know what else we can do to make this site a better resource for our visitors. Best time to see our live presentation is during a tour or event. You are invited to join us during these group dates.